Much of the United States saw their first round of winter and snow this weekend, but this is just the beginning. The question is: Is your car ready for this winter? Ice scraper - A snow and ice scraper with a long handle and brush will make cleaning your car off much easier. Windshield washer fluid - This will help keep your windshield clear of salt and snow. Flashlight - You may need this in case your vehicle breaks down after dark. Blanket - If your car battery dies you'll be glad this is in your trunk. First-aid kit - Whatever the season, it's always a good idea to keep a first-aid kit on hand. Food and water - If you become stranded during a storm, it's important to stay hydrated and energized. Jumper cables - You'll need these in case your battery dies. Shovel - Sometimes there's no alternative but to shovel if your car becomes stuck. 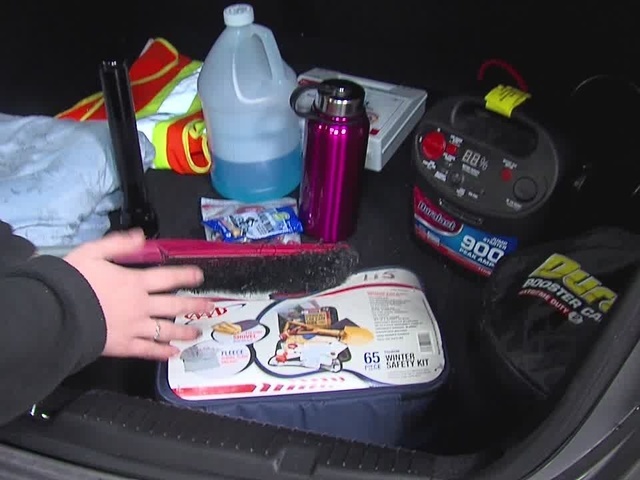 Sand or cat litter - You may need to throw one of these items on the snow under your tires to help gain traction. Flares - If your car breaks down or you become stranded these can help alert others near you. The law enforcement also recommends keeping at least a half tank of gas in your car at all times during the winter.